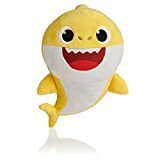 Get out your earplugs, because the Pinkfong Baby Sharks are back! As if they’ve ever left. If you’re still looking to find out exactly where you can buy these plush dolls (from hell), you’re in luck. We found them online so you might as well as stock up on as many as you can because, there are multi-colors and shapes. What joy. Read on! You know how your kiddos say and sing the same things over and over again (we’re hat-tipping to you, Barney)? 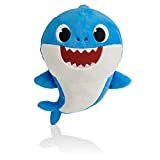 Well if you’ve been blessed with the gift of hearing and you have kids, most likely you’ve heard that infamous Baby Shark song over and over again. And over again. And once more for good measure. Apparently it wasn’t just your kids who were sining that song. Everyone was. Correction. Everyone is. In fact, as of the beginning of April 2019, the song actually hit the Billboard Hot 100 Songs. Yep, it’s not going anywhere anytime soon. 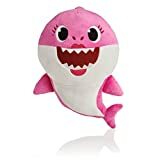 Well, you’re in luck because one of the hottest toys everyone wanted was the new Pinkfong Baby Shark (singing) plush doll….er…we meant ‘toy.’ Here’s everything we know about them. How Many Different Sharks Are There? 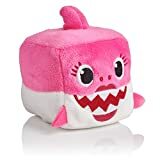 [ UPDATE ] There are also three new Baby Shark ‘Cubes’ too that are currently in-stock! 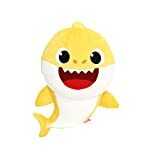 When they were originally released by WowWee back in the late fall, you could pre-order them, but once they were officially released they were just available to purchase. Now, however, they’re super tough to come by so grab them while you still can! 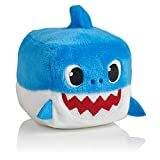 What’s the Price on These Plush Little Guys? The suggested retail price is just $16.99. Thanks to the most recent holiday season, they were pretty much sold out everywhere and many were forced to pay more than that price on places like eBay. While we don’t always love having to buy things that are sold out on eBay (due to random pricing) they do always seem to have everything we’re looking for. Even these singing dolls! Where Can You Actually Find Them In-Stock? This is the tricky question since they seem to go out of stock as quickly as them come in! Below you can find some of the recent places we’ve found them. We wish you the best of luck!